The Story Behind Baby Skates. . . FINALLY! Really cute ice skates for Babies, Toddlers, and Smaller Children! Now they can go out and ice skate too! In a safe and well designed product engineered specifically for them, BABY SKATES! We are proud to manufacture our BABY SKATES in the United States of America by folks who care about QUALITY - SAFETY - and OUR CUSTOMERS! Hello and THANKS for your interest in both our product and our story about this amazing product called BABY SKATES. My name is Christopher Gasper, I am a proud Father of (3) great little boys and truly Blessed! While teaching and working with our 3 year old son on how to ice skate, I was able to see and experience first hand both parents and children getting frustrated. They just weren’t having fun together at the ice rink or pond. Mostly because no one ever made a safe and reliable ice skating product for a toddler or a smaller child. What was offered was not designed well at all or had very poor quality and usually broke during the first use. Comfortable and great fitting ice skates in smaller sizes with true wider widths never existed! 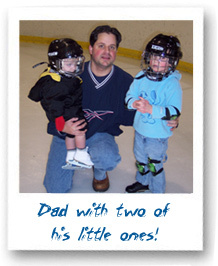 THERE WERE NO SAFE AND RELIABLE PRODUCTS AVAILABLE FOR LITTLE ONES TO LEARN HOW TO ICE SKATE! I saw a lot of crazy things going on with parents who were trying to help out with teaching their little ones how to ice skate, but mostly it just led to more bad times at the ice rink. Parents using single blades that were not even close to fitting them, they stuffed on extra socks, they put mittens on their feet, they laced them up so tight that they couldn’t even move, and so on. There were even people who tied some type of ice skates around the outside of their sneakers. LITTLE CHILDREN AND TODDLERS WERE BECOMING DISCOURAGED NOT ENCOURAGED! All of these attempts and efforts led to bad times and troubles at the ice rink! Young little tots were falling all over, couldn’t walk straight, couldn’t use a single blade, and the tie up things around the sneakers always seemed to be breaking off or bending. Also at many ice rinks and outdoor facilities I noticed that if you had no ice skates you couldn’t go out on the ice. Simply put it was, no skates - no ice time. 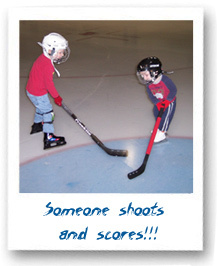 That usually left someone inside the ice rink to watch the little one while everyone else was out there having fun! How fun was that for the FAMILY? ONE LITTLE STEP FOR A SPECIAL LITTLE ONE – ONE GIANT STEP FOR DAD! 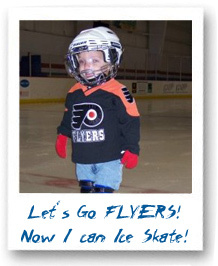 Well you see the day came that our younger son (who was just over a year old) was really itching to get out on the ice. It really seemed as though he wanted to get out on the ice and have some fun with brother. Well from what I had seen and learned from other parents and smaller children; I didn’t want to make the same mistake and DISCOURAGE him. I did not want to put him into a poorly designed product or a scrappy piece of garbage that was made overseas. NOBODY MADE QUALITY ICE SKATES – IN HIS SIZE RANGE AT ALL! After all of the searching and endless research it led me to design and develop a pair of HIGH QUALITY ICE SKATES for my special little ice skater! It took more work and research than you could imagine because we were making something that never existed – a BABY ICE SKATE! It had to be constructed to last, built with high regards to comfort and fit, and for smaller children with usually a wider or chubby foot width or dimension. Most importantly it had to have QUALITY built into the product throughout! I was building these for my son so you know that I was concerned about his safety, the fit, and the reliability! It took time for product development and testing. We even had a group of smaller children to help us test our product out. Also we made sure to include the feedback and insight from various important groups and organizations; Learn to Skate Organizations, Figure Skating Teachers and Coaches, Hockey Program Coordinators and Coaches, Hockey Players, Figure Skaters, Speed Skating Trainers and Coaches, and more. All of there feedback, shared experiences, suggestions, and time was greatly appreciated! I had so many models and parts of ice skates all over our dining room and kitchen table, there were hundreds of them scattered about. There were meetings with suppliers and people who could give me some help. It was a lot of running around and much work. THE BIG DAY ARRIVED – WITH A SLIP SLIDE AND AWAY! The big day had come… I took my son out on the ice in his newly made pair of BABY ICE SKATES! In short he took to it like a little duck to water! He received a lot of attention and yes he was even a bit of a little show off! I’ll remember that day for the rest of my life he was only around a year old. 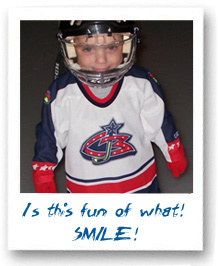 My determination and love for him helped him to get on the ice at a more accelerated – earlier age and he was having fun. Even though the experience was a little new for him being out on the ice, you could tell and just watch that he was having fun and learning something new in the process. HAPPINESS IS BEING PART OF THE GANG! IT IS NEVER TOO EARLY TO LEARN HOW TO ICE SKATE OR HAVE FUN! At about (17) months our son was out on the ice as a regular having fun with his brother and friends. He was handling it all by himself and enjoying it too. He looked forward to gathering and packing his pair of BABY ICE SKATES and went out ice skating about once a week. BABY SKATES IS TEACHING LITTLE ONES AROUND THE WORD TO ICE SKATE! We are still making these super-cute little ice skates as though they were being made for my son. We pay great attention to detail, quality, safety, and craftsmanship throughout the entire process. We still test each and every single pair throughout and make sure they meet our quality, safety, and relibility standards. 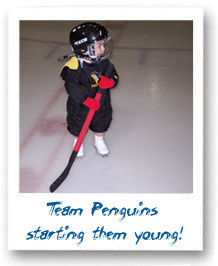 We still follow the goals that were thought of when the first pair of BABY ICE SKATES was being put together. 1). If is not good enough for my son - then it is not good enough for your little ice skater. Make them exceedingly well from the blade to the boot. Be proud to have them MADE IN AMERICA! 2). Do unto others as you would like done to you. We treat all of our customers like they are FAMILY! SPEND TIME WITH THE SMALL BLESSINGS THAT ARE IN YOUR LIFE TODAY! THEY WILL ONLY STAY THAT SMALL FOR SO LONG!